Posted July 7th, 2017 at 5:41 pm | Log in to reply. This is the next recipe of yours I’m going to make, I made cheese buldak today. I find it funny that other mums would make something to last for days if she was gone, my mum if she was going away for some days would leave us to fend for ourselves. We would have to make dinner ourselves if we wanted dinner that day. It probably helped that my dad always liked puttering around the kitchen and I inherited that. It was my dad that taught me to cook, not my mum. She isn’t a bad cook but it’s all very tame in my opinion. She would never try her hand at some Korean food, she is however very good at baking! When I was 12 I was home for the summer with just my siblings, both older than me, whilst my parents were at our cabin, I have serious pollen allergies and our cabin is surrounded by woods. Despite being the youngest I was the one fixing dinner and making sure my siblings ate and came home at night. Posted December 3rd, 2016 at 10:24 am | Log in to reply. Posted November 14th, 2016 at 7:02 am | Log in to reply. 1. When it was finished, I added 3 mixed eggs carefully in the soup, when it was not more boiling. Then I waited for 30 Minutes and mixed the soup up, very good! 2. I let the soup cool down and waited 24 hours, before eating it. 3. I added much more salt and very hot Chili flakes. It must be so hot, that you sweat when eating it. 4. I served it with rice ( as you say ) and some glass noodles, as I am a great noodle lover, this was also very good. 5. The rest is going into the deep freezer and so I can enjoy the soup later in the year again and this has the big advantage, that you do not smell all those ingredients before, when you cooking it. Posted November 8th, 2016 at 4:57 pm | Log in to reply. Posted November 8th, 2016 at 9:10 am | Log in to reply. 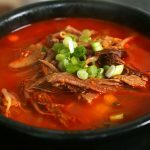 When I was 25 years old, I used to go together with my wife to a fantastic korean Restaurant in Wuppertal, Germany and we used to eat Yukgaejang there, the best soup of the world! It was extremely spicy but absolutely great in taste. They served it with rice and Kimchi! When I was 40, I went there again with my wife, but this was the last day of the restaurant, before it closed for ever. Now I knew, that I would never get this soup again and I offered them 400 DM ( the currency before EUR , about 250 $ ) for the recipe, but they didn’t give it to me, unfortunately. Now I am 57 years old and found your recipe on your page, I am absolutely fascinated! On the next weekend I will try it! Now some questions: I can get gosari here in a Korean shop in Düsseldorf, but it is dried. Can I cook it up for 30 Minutes and let it rest over night before using it? I remember, there were eggs in that soup in that restaurant. Can I add, shortly before it is finally finished, 2 mixed eggs into the soup and wait for 10 Minutes? Can I also use Turande instead of gosary or gosari and Turande? I am very excited now and can hardly wait to the weekend, when I will try it. I will let you know, how it was, thank you so much! Posted November 8th, 2016 at 11:57 pm | Log in to reply. 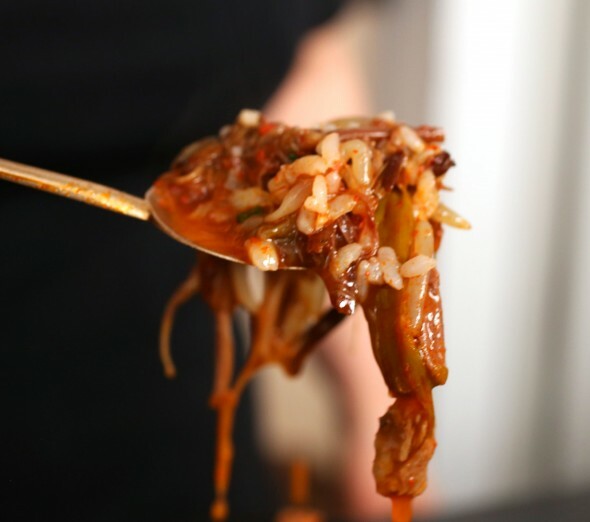 I hope you love my yukgaejang recipe. You must be so passionate about delicious food, just like me! Just as Sanne replied, follow the link and you can see how to soak your gosari to make it tender. If you have a pressure cooker, you can boil your gosari for 30 to 40 minutes and then rinse it in cold water before using it right away. This is what I do, these days. I think your egg idea sounds good, try it! You can also use both torandae (taro stems) and gosari together. 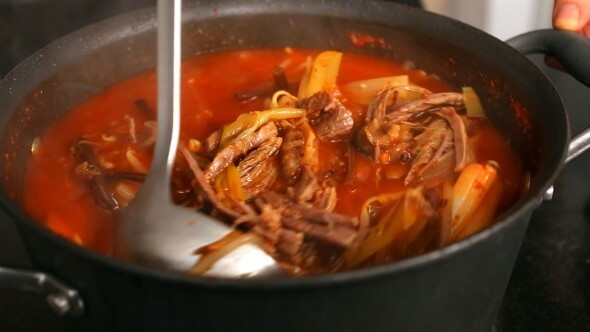 Good luck with making delicious yukgaejang! Posted November 6th, 2016 at 8:21 am | Log in to reply. Posted October 17th, 2016 at 12:12 pm | Log in to reply. I love this soup but I’m not a big fan of gosari. Can you recommend other vegetables that will go well? Posted October 18th, 2016 at 4:53 pm | Log in to reply. Add more green onions and mushrooms. Posted April 22nd, 2016 at 4:28 am | Log in to reply. Bought your book the other day but still prefer your videos! What is your opinion of using mung bean sprouts instead of soy bean sprouts? Posted April 24th, 2016 at 8:56 pm | Log in to reply. Great! You won’t miss any cooking! I use mung bean sprouts in this recipe. Posted April 11th, 2016 at 2:11 am | Log in to reply. Thank you again for being such a great inspiration. You make cooking process look easy..
My question is, is it OK to add vegetable that’s been seasoned after we reboild the chopped mushroom and beef? Will it change the taste or something? Because I wanna eat kind of crunchy mung bean sprout and green onion. I just thought that boiling them over 10min will make them mushy..
Posted April 2nd, 2016 at 5:40 pm | Log in to reply. Hi Maangchi! This is, by far, my favorite recipe. I’ve been a silent reader and have been watching your videos for over a year now. I just watched your 1 million viewers video and am so happy and excited for you as you deserve that and so much more! I literally cried happy tears as I watched it!! As all others have said before me, I get so happy when I watch you cooking. Your excitement and joy is so evident in your videos. Thank you for bringing me so much joy in my life, especially on days when I feel down. Sending you hugs and kisses. And congratulations on your achievement!!! And yes, I entered the t-shirt contest but I also hope you think about selling them too. I’m sure a lot of people will buy them!! I know I will. Posted April 4th, 2016 at 7:47 pm | Log in to reply. Hello, hello! You are one of my 1 million subscribers! Thank you so much for your nice words here! Cheers! Posted March 20th, 2016 at 1:46 pm | Log in to reply. Hello, Maangchi! In your old video for this recipe you mentioned an ingredient “toran” or taro stem. My local H-Mart sells dehydrated taro stems. Would it still be good to use them in this recipe? Would I need to soak them first? Posted March 22nd, 2016 at 8:30 pm | Log in to reply. Dehydrated taro stems are difficult to handle. You will have to boil and soak for a long time, changing water several times. Posted March 23rd, 2016 at 3:54 am | Log in to reply. 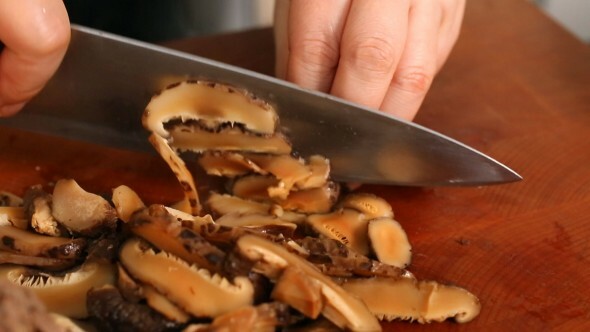 Maangchi, have you ever tried using fresh taro stems instead? The texture might be different from dried but it is much easier to use. Vietnamese markets sell fresh taro stems (bac ha) for making Vietnamese sour fish soup. Posted March 23rd, 2016 at 5:13 pm | Log in to reply. Posted March 20th, 2016 at 5:04 am | Log in to reply. Hello Maangchi!! 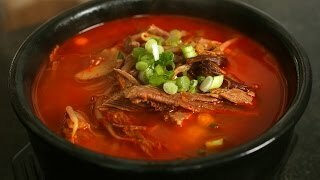 I searched for some recipes of korean food but some of them at youtube i didn’t really like but today i found your videos and i loved them!! i have to cook immediatly!! :) thanks for your great videos!! Posted March 20th, 2016 at 1:24 am | Log in to reply. Posted March 22nd, 2016 at 6:46 pm | Log in to reply. 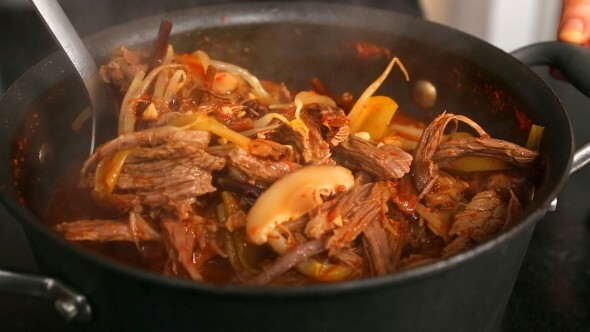 You made absolutely delicious and hearty yukgaejang! I’m so happy to see it! Posted March 19th, 2016 at 10:27 am | Log in to reply. I’m a huge noodle lover, too! : ) You can add sweet potato starch noodles (dangmyeon) to yukgaejang. 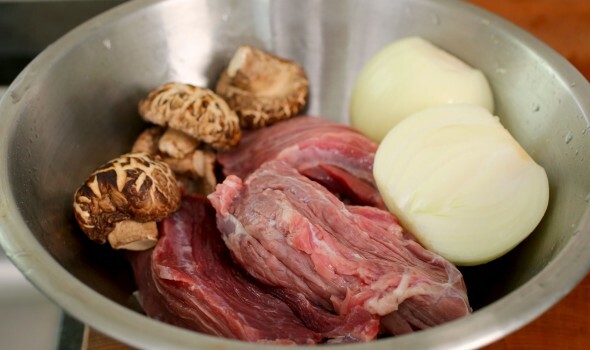 If you do, add them at step 6 in the recipe along with beef and mushrooms. The noodles will expand and get soggy in the soup if you don’t eat the soup quickly though. Posted March 2nd, 2016 at 7:50 pm | Log in to reply. Hi there. I love your site and your recipes. I make this dish for my Korean wife often and she loves it. I think there is one small mistake in your ingredients. You call for 5 tsp of salt. I think this is far too much and I think it must be a typo. I added 3 1/2 the first time I made it an it was crazy salty. I’m now down to 1 tsp of salt and 1 tbsp of beef broth powder. Also, I double the ingredients (except the salt) in the “hot pepper oil sauce” and that suits our tastes better. The video was watched 996,239 times on YouTube & has 17,841 likes! This video is a remade version of an earlier recipe. The original video was posted on and has 0 views.